Willem Claeszoon Heda (December 14, 1594, Haarlem - c. 1680, Haarlem) was one of the earliest Dutch Golden Age artists devoted exclusively to the painting of still lifes. 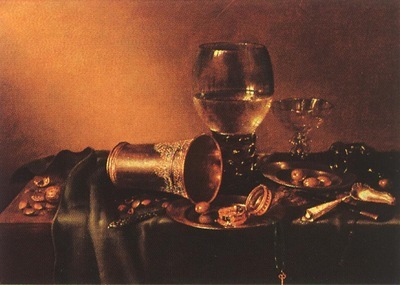 Heda, Willem Claesz and Pieter Claesz. are the most important representatives of ontbijt (breakfast piece) painting in the Netherlands. His overall grey-green or brownish tonalities are very similar to those of Claesz., but Heda's work was usually more highly finished and his taste was more aristocratic. He showed a preference for ham, mince-meat pie, and oysters, and after 1629 never included a herring in his pictures. His son Gerrit (d. 1702) was his most important pupil.